This volume is the most detailed case study of land tenure in Hawai i. 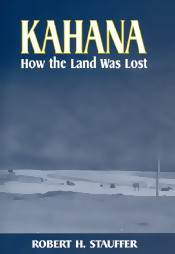 Focusing on kuleana (homestead land) in Kahana, O`ahu, from 1846 to 1920, the author challenges commonly held views concerning the Great Mähele (Division) of 1846-1855 and its aftermath. There can be no argument that in the fifty years prior to the 1893 overthrow of the Hawaiian monarchy, ninety percent of all land in the Islands passed into the control or ownership of non-Hawaiians. This land grab is often thought to have begun with the Great Mähele and to have been quickly accomplished because of Hawaiians ignorance of Western law and the sharp practices of Haole (white) capitalists. What the Great Mähele did create were separate land titles for two types of land (kuleana and ahupua a) that were traditionally thought of as indivisible and interconnected, thus undermining an entire social system. With the introduction of land titles and ownership, Hawaiian land could now be bought, sold, mortgaged, and foreclosed. Using land-tenure documents recently made available in the Hawai i State Archives Foster Collection, the author presents the most complete picture of land transfer to date. The Kahana database reveals that after the 1846 division, large-scale losses did not occur until a hitherto forgotten mortgage and foreclosure law was passed in 1874. Hawaiians fought to keep their land and livelihoods, using legal and other, more innovative, means, including the creation of hui shares. Contrary to popular belief, many of the investors and speculators who benefited from the sale of absentee-owned lands awarded to ali i (rulers) were not Haole but Päkë (Chinese).Kahana: How the Land Was Lost explains how Hawaiians of a century ago were divested of their land--and how the past continues to shape the Island s present as Hawaiians today debate the structure of land-claim settlements.